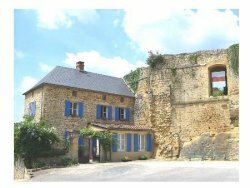 Superb 200 year old villa constructed onto the ramparts of the 11th century Ch�teau of Carlux in Dordogne. 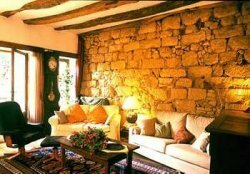 Perched up on a rock face overlooking the valley of Carlux, this truly unique property with a character all its own is a dream come true for lovers, romantics and those passionate about medieval France's tumultuous history. 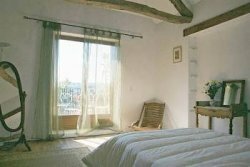 Constructed after the French Revolution from stones taken from the Ch�teau, this delightfully bright and spacious 4 bedroom, 2 bathroom home can as graciously sleep 9 as it can a single couple, and is charmingly furnished to a high standard with hand made furniture in the traditional style of the Perigord region. True relaxation is offered here with a 5/6 person jacuzzi. The fully enclosed back garden, bordered on one side by the tall ramparts of the Ch�teau and on the other by the drop of the rock face, has two separate terraces. Graced by jasmine, wisteria and elegant old rose trees, these terraces open out onto splendid views of the rolling valley and enclosed garden. Having private dinners by flaming torch light at the base of the Ch�teau ramparts is an unforgettable experience not to be missed. The front garden with its long blooming white roses and vine-covered trellises winds its way around the house creating intimate shady alcoves. This very special villa is a unique holiday rental at any time of the year. 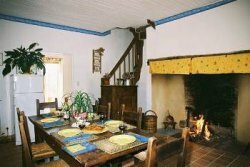 There is not only central heating and a large traditional working 'cantou' fireplace (perfect for barbecuing) in the kitchen, but also a cast iron, wood burning stove in the living room. The beauty of the region's renowned honey-coloured stones is as striking in the fading light of autumn as it is in the long evenings of summer. Long winter nights can be spent among friends lingering over dinner or curling up on the couch in front of the blazing fire.